One of the toughest parts about trying to be healthier is deciding how to do so. Part of that determining process should involve a degree of research in order to find out what is healthy, what will get the best results, and more. This guide is intended as a basic starting point for anybody considering the ketogenic or low carb lifestyle. The ketogenic diet is essentially eating few enough carbs (from all sources) that your body goes into ketosis and burns fat instead of carbs for energy. Many people use this lifestyle to lose weight, but there are also a great number that maintain the ketogenic lifestyle for the cognitive and health improvements. All types of carbohydrates, be them from fruit or vegetables or cake are digested by the human body into sugar. If you cut these from your diet, you body's easiest fuel source is gone and it will instead burn fat. How do I follow the ketogenic diet? While there are few hard set rules for the most part - some people also avoid artificial sweeteners or even cheese and peanut butter. But, eating few enough carbs that your body enters ketosis is the one requirement. What foods do I avoid? All high carb foods like breads, sweets, and starches should be skipped or extremely limited. Most fruits and many vegetables have high sugar levels as well. Meats and full fat dairy have the lowest carb count. Leafy greens, the squash family, and cruciferous vegetables are pretty low in carbs as well. How many carbs per day is the limit? For nearly all people, consuming fewer than 20 grams of carbs per day is all but guaranteed to put you in ketosis. Many people can go up to 50 or even 100 if they are very active. It varies individually. What if I don't have enough time to home-cook all of my meals? There are many ways to quickly get food and remain in ketosis. The Keto flu refers to a transitional period when your body is switching its fuel source from carbohydrates to fat. Initially, the body might feel a little bit more sleepy, less energetic, to even more full-blown flu-like fatigue symptoms. This depends on the diet followed previously. The higher the previous carb count, and lower the fat, the bigger of a transition the body will need to go through. This period varies in length, depending on how low your new carb count is (how quickly you will burn through your body's glucose stores), and other individual factors. After the keto flu subsides, you can experiment with dropping supplementation and getting all of your electrolytes through your food. Other than bone broth, you can make sure to eat a good variety of foods high in magnesium and potassium, and make sure to add some salt to your meals. U/AshSimmons' post on "Keto Flu - Symptoms..." has more information on the Keto flu. These are super tasty and quick to make! You add the ingredients to the crock pot after minimal prep, cook it up like a typical pork roast, then fry the shredded pork for a few just to crisp it up. Serve in low-carb tortillas with cheese, sour cream, olives, and whatever else you enjoy. Super easy as well! Just brown the ground meat and cook the bacon before hand (I did mine the night before - never any spare time in the A.M.), slow cook all that tasty business all day long, top with sour cream and shredded cheese and eat. Tasty and easily adjusts for different pizza variations to satisfy your pizza cravings. Skip potatoes, replace rice with riced cauliflower, and skip raisin topping! All you do to make this recipe keto friendly is skip the bread crumbs! Great veggies to go with a nice steak include broccoli, salad, mashed cauliflower, green beans, asparagus, and a squash medley! For these you can either use those awesome mission low carb tortillas, lettuce wraps, or even taco shells made out of cheese. Pretty much all taco fillings are low carb - just keep an eye on tomatoes and salsa, there are a couple carbs in those. Since my second baby was born in February, I have been eager to get back into my low carb lifestyle. However, as studies of breastfeeding women are unethical (thus no studies have been done on breastfeeding while in ketosis), I have been hesitant to jump right back to fewer than 20 carbs per day while my daughter is so young. I have been limiting my carbs to 100g per day at most. From my recently carb-heavy diet to ~75-100 per day, I saw absolutely no drop in my supply. But. Keep in mind that I did not watch my calorie intake in the slightest. The two most important things for maintaining your breast milk supply are sufficient calories and water intake. I plan to keep myself in the range between 50-100g carbs per day for now, easing my intake of the sugars and starches gradually down. From others' experiences, they only went through a 1-2 day temporary drop in supply, and they supplemented with their freezer stash. If you do this, be sure to pump for an extra "feeding" in order to prompt your breasts to continue to produce more milk and increase your supply. I apologize for the quick entry! I plan to contribute more again shortly. With the multitudes of clashing information out there, it can be easy to come to different conclusions regarding immunizations. The purpose of this series is to shed some light and dispel the biggest myths surrounding vaccinations. 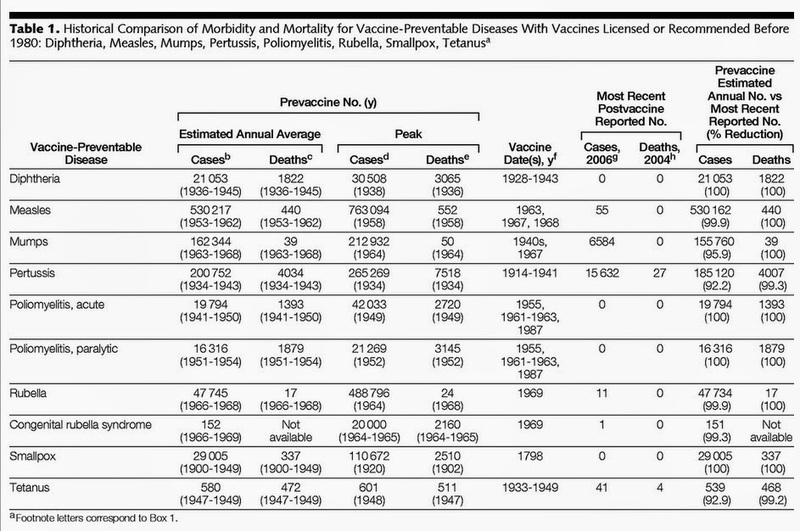 "Decline in Rates of diseases prevented by vaccines are due to better hygiene and healthcare; not vaccines." This first graph is often reported as the proof that disease rates for vaccine-preventable diseases were in decline long before the vaccines were in effect; purportedly due to better healthcare, sanitation standards, and cleaner living. Looking at the graphs, it appears to give a clear conclusion in opposition to vaccines. However, it is important to note the distinction that these graphs show death rates in decline - not rates of the disease being contracted declining.This simply means that people were living with these diseases, or at least for longer periods before succumbing to them. With advancing healthcare and cleaner living standards, it is no wonder the death rates were in decline even before the invention of vaccines. People who contracted polio were no longer dying so quickly - in fact, with the invention of the iron lung, those people could continue to live for up to decades. 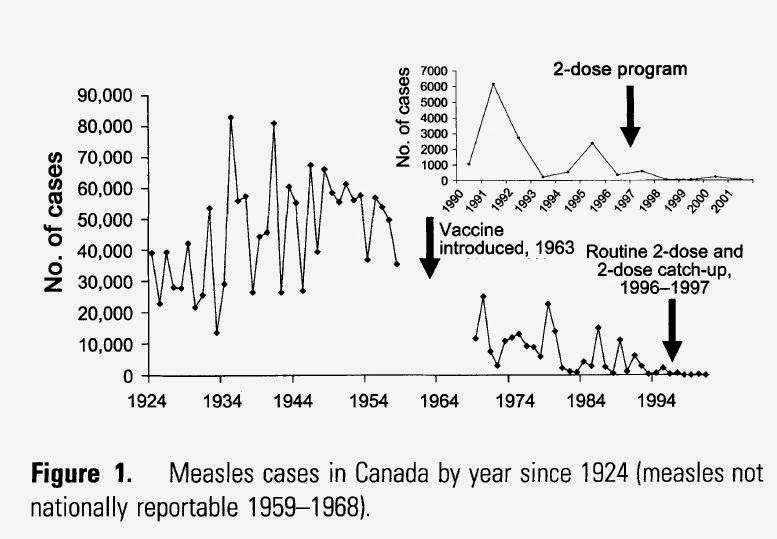 What's more relevant to the introduction of regular vaccinations, let's consider the cases of disease itself (Measles, in this case) versus the introduction of vaccines. For some context of vaccine success from other continents, here is a quote from CDC (linked through WHO at the bottom). This quote is in regards to developed countries who started with high vaccination rates. Those rates decreased as people saw less of each disease, and the diseases bounced right back, despite similar or better rates of sanitation and healthcare. "Finally, we can look at the experiences of several developed countries after they let their immunization levels drop. Three countries – Great Britain, Sweden, and Japan – cut back the use of pertussis vaccine because of fear about the vaccine. The effect was dramatic and immediate. In Great Britain, a drop in pertussis vaccination in 1974 was followed by an epidemic of more than 100,000 cases of pertussis and 36 deaths by 1978. In Japan, around the same time, a drop in vaccination rates from 70% to 20%-40% led to a jump in pertussis from 393 cases and no deaths in 1974 to 13,000 cases and 41 deaths in 1979. In Sweden, the annual incidence rate of pertussis per 100,000 children 0-6 years of age increased from 700 cases in 1981 to 3,200 in 1985. It seems clear from these experiences that not only would diseases not be disappearing without vaccines, but if we were to stop vaccinating, they would come back." -- CDC Atlanta "Six Common Misconceptions about Immunization"
WHO - Six Common Misconceptions - "2. Diseases had already..."
"Complications and risks of vaccine-preventable diseases aren't that bad." Many of those who are against vaccination claim that contracting one (or all) of these diseases is not all that dangerous. Here are the statistics on several vaccine-preventable diseases. Complications of contracting the measles range from common and inconvenient to life-threatening dependent on a number of factors. Common complications include ear infections (1 in 10 children experience this) and poorly treated/untreated could potentially lead to permanent hearing loss. Additionally, 1 in 10 adults are likely to experience diarrhea. Severe Complications include pneumonia and encephalitis. Up to 1 in 20 children with measles will get pneumonia, which is the most common cause of death in young children with measles. Roughly 1 in 1,000 children who get measles will develop encephalitis, which is swelling of the brain. This can lead to convulsions - ultimately it can cause the child to be permanently deaf or with an intellectual disability. For pregnant women, measles can cause premature birth or a low birth weight baby. There is also a very rare long-term complication that develops roughly 7 to 10 years after a seemingly full recovery from measles - Subacute sclerosing panencephalitis (SSPE). When measles was widespread and quite common, this disease of the nervous system occurred in 4 to 11 out of 100,000 people who had contracted measles. As with the measles, pertussis can have some life-threatening complications stemming from contracting the disease. In teens and adults, the complications are milder, but still can be cause for concern in many individuals. The most severe type of invasive pneumococcal disease is meningitis. For children under 5 years old, roughly 1 in 10 dies of the infection, while others may develop hearing loss or developmental delay. Bacteremia is another type of invasive pneumococcal disease which infects the patient's blood. Children with this form of the disease have about a 4% chance of dying due to the blood infection. Pneumonia infects the lungs and can cause varying levels of illness in people of any age. Complications of pneumonia include empyema, pericarditis, endobronchial obstruction with atelectasis, and abscesses in the lung. Around 5 in 100 people with pneumonia will die from it. "Ingredients like formaldehyde, mercury, aluminum are harmful in vaccines, especially for young children." In many vaccines Aluminum salts are used as adjuvants, which are substances that increase the body's immune response to the vaccines. The types of aluminum salts used in some vaccines in the US include aluminum hydroxide, aluminum phosphate, alum/potassium aluminum sulfate, or mixed aluminum salts. These have been used in vaccines like the DTaP, pneumococcal conjugate, and hepatitis B vaccines, as well as others, for over sixty years, and have only rarely been associated with severe reactions. A PubMed Study compared the MRL (minimum risk levels; established by the Agency for Toxic Substances and Disease Registry) to the body burden of aluminum from vaccines as well as diet through the infant's first year of life. "We conclude that episodic exposures to vaccines that contain aluminum adjuvant continue to be extremely low risk to infants and that the benefits of using vaccines containing aluminum adjuvant outweigh any theoretical concerns." Except for some flu vaccines, since 2001 thimerosal has not been added to any of the scheduled childhood vaccinations. It is used as a preservative in multi-dose containers of immunizations, which helps to keep the costs down for people getting vaccinated. Formaldehyde is used in vaccines in order to inactivate viruses to avoid causing the disease to actually be contracted with the immunization. It also is used to detoxify bacterial toxins - as is the case when used in the diphtheria vaccine. Formaldehyde is naturally produced by the body when making amino acids, producing energy, and more basic bodily processes. It is also found in our everyday environment. While excessive amounts of formaldehyde may cause cancer, the highest risk is from air pollution, and generally occurs with those who work with formaldehyde directly. When it comes to infants, studies have shown that for a newborn of 6-8 lbs, the amount of formaldehyde at a given moment could be 50-70 times higher than any single vaccine would deposit. "Descendant cells are the medium in which these vaccines are prepared. The cell lines under consideration were begun using cells taken from one or more fetuses aborted almost 40 years ago. Since that time the cell lines have grown independently. It is important to note that descendant cells are not the cells of the aborted child. They never, themselves, formed a part of the victim's body." A quick summary on how this is used toward vaccines: A primary cell culture is taken directly from living tissue. By isolating single types of cells within a culture we can develop a cell line, which can then be used for continuous observation and control otherwise not possible. Using these cell lines, researchers are able to grow human pathogens and attenuate (weaken) them. One way of doing so would be to alter the virus so that it is unable to grow successfully in normal human body temperature. They do this by repeatedly growing the virus in human cells kept at low temperatures, meaning it works better on low temperatures; worse in actual, live human beings. "Risks from the vaccines themselves outweigh risks from the diseases they prevent." "When evaluating data from VAERS, it is important to note that for any reported event, no cause-and-effect relationship has been established. Reports of all possible associations between vaccines and adverse events (possible side effects) are filed in VAERS. Therefore, VAERS collects data on any adverse event following vaccination, be it coincidental or truly caused by a vaccine. 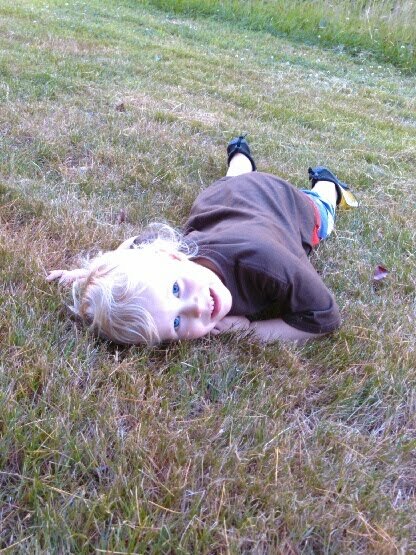 The report of an adverse event to VAERS is not documentation that a vaccine caused the event." In other words, there is no evidence behind the claims made by those who posted. And now, some specific comparisons between the severe risks of vaccine-preventable diseases, and the severe risks of immunizations for those diseases. Source: CDC - What are the Risks from MMR Vaccine? 1 in 10 patients can die even with treatment - without treatment the number is as high as 1 in 2 people die. CDC - What are the Risks from MMR Vaccine? It is important for everyone to read and do their own research, and make certain to avoid echo chambers where people just continuously repeat and reiterate the same points. Find new resources, but be sure to check for validity of the source. If you would like more explanation or in-depth answers, or you have alternate sources you would like me to consider, please leave me a comment. Also, feel free to comment on the vaccine myths you'd like to see discussed.